Poor seasonal conditions over recent years have increased the number of nutrition enquiries being received by extension staff. To ensure queries are being addressed adequately, 23 DAF extension and technical officers recently attended a beef cattle nutrition update. Held in Atherton in early December 2018, the workshop provided an opportunity for knowledge sharing between highly experienced staff and those looking to improve their skills. A key goal of this event was to increase the knowledge and confidence of staff to effectively address these enquiries. Two members of the NQ Dry Tropics grazing team took joined the group. Dry season supplementation – protein and energy. Other nutrition decision tools – Ration Calc and Feed vs Sell. 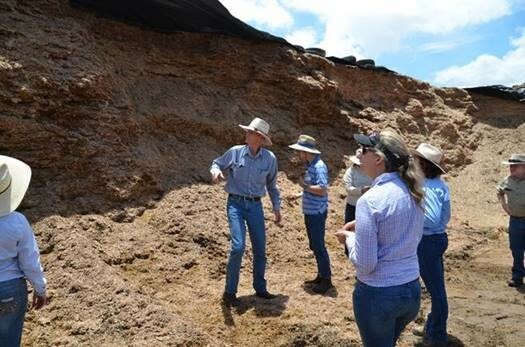 The group visited St Ronan’s feedlot, Mt Garnet, to look at northern production feeding systems based on dryland silage, then drove north to inspect the Redlands leucaena trial. This is the first large scale grazing trial with the new variety. Pasture Dieback and its impact was discussed by Stu Buck. Specific cattle nutrition training included hands-on calculation of nutrient requirements for different classes of cattle, across a range of scenarios. The workshop was a great opportunity for staff to increase their knowledge and skills, have specific questions answered and build relationships across regions. 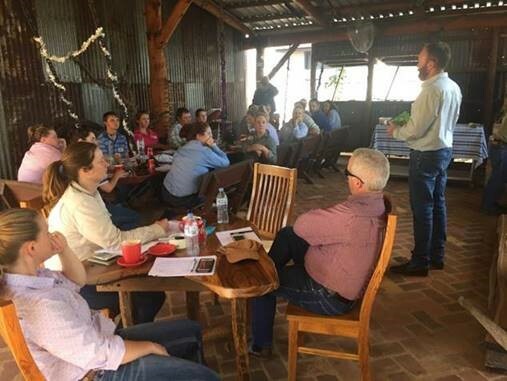 Succession of knowledge and skills is imperative for DAF beef extension to remain a reliable source of cattle nutritional advice to graziers.